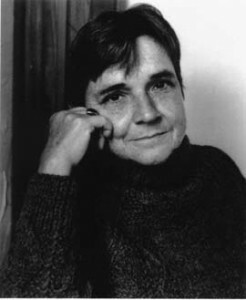 Here is a video from YouTube of Adrienne Rich reading her poem ‘Diving into the Wreck’. There are some interesting visuals with it and a beautiful soundtrack too. In order to be able to anwer a comprehensive essay on the poetry of Adrienne Rich, be sure that you know each of the following aspects of her work. Make notes on each heading to supplement the work done in class. You must be able to quote to support your analysis of each theme. What techniques are frequently used in Rich’s poetry? You must be able to identify them (through quotation) and also comment on their function and their effectiveness. Ensure that you are able to comment on the form / structure of each of Rich’s poems. Why has she chosen to structure a poem in a particular manner? Does the structure reflect the theme? If so, how and why? Comment on Rich’s style of poetry i.e. confessional, the use of a speaker etc. What effect does her style have on you? Does it appeal to you? The images in Rich’s poems are unusual, interesting and evocative. Choose at least three images from each poem that you are studying and be sure that you can describe what they depict and why they appeal to you. Know a little about Rich’s life. You won’t be asked directly about her life story, but it will give you a greater understanding of her work. Your personal response is personal to you and so cannot be learned from any notes. It must be developed through knowing and understanding each poem. A personal response will be expected from you, even if the question does not explicitly ask for it. However, the key to doing well on an essay about the poetry of Adrienne Rich, as well as any other essay, is to answer the question that is asked. Summarising the poems or simply writing everything you know about Rich will not benefit your essay.